Everyone learns differently, so we customize your learning and development program to meet your specific needs. We can start from scratch or we can take your existing one-dimensional training materials and transform them into multi-faceted blended learning tools. This is made possible through the various learning methodologies we offer. We have the ability to take the same content and make it work globally for different education levels, technology mediums and delivery modes within the organization. Our experts assess your people and create the right combination to effectively increase performance. This support tool is a browser-based system that improves worker productivity by allowing the user to quickly access information, images, and other resources pertaining to a complex task or job. It also helps the worker to maximize job performance, while requiring a minimum amount of intervention by others. 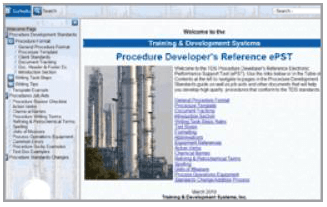 The example here shows the tool used by procedure developers at TDS to ensure that they are following the appropriate formatting and content guidelines as they create the high-quality procedures for our clients. When several people are responsible to carry out the same task or job, the EPST helps to ensure that there is consistency in how the tasks are performed. There are many potential uses for these tools in the oil and gas industry. When your needs don’t warrant a full training session, TDS provides one-on-one mentoring and small group instructor-led sessions, either at your location or ours. TDS Performance Advisors coach and mentor training professionals who are assuming a new role in the learning organization, or who see the need to develop their skills in different areas. This one-on-one approach allows the mentored individual to gain insight, have an open environment to practice techniques, and hear critical feedback on performance as milestones are met. Goals are set in advance and both the learner and the mentor develop a schedule of events and course of action to accomplish the goals. Material is provided from which the learner gains knowledge. Activities for application that are relevant to the learner’s environment are provided and critiqued upon completion. As always, coaching and feedback are critical components to the process. The overall benefit to the learner is a custom plan that meets specific learning and developmental needs. This type of learning intervention is sometimes referred to as CBT (computer-based training) or WBT (web-based training). It represents all varieties of electronically delivered learning events, whether the mode is via a browser over the Internet, on a company’s internal network, on a CD, or in some form of mobile media. eLearning is basically the transfer of knowledge and skills via a computer-enabled medium. • Synchronous – where a learner attends a facilitated session in real-time via a computer-enabled interface, often with the ability to interact with the facilitator and other participants. • Asynchronous – where the learner attends the recorded learning event at a time that is convenient for him or her. These sessions often include interactive elements, videos or other multimedia, and quizzes, and may or may not involve a recorded facilitator. TDS can create both synchronous and asynchronous learning events and use them in a blended learning environment to maximize learner engagement as well as knowledge and skill retention. Blended learning, by definition, blends a variety of learning modes and media to engage a learner visually, aurally and mentally resulting in a more effective transfer of skills and knowledge. Adding three-dimensional drawings, animations and simulation to a learning intervention helps to better orient operators and maintenance technicians to the process and equipment they are running or repairing.